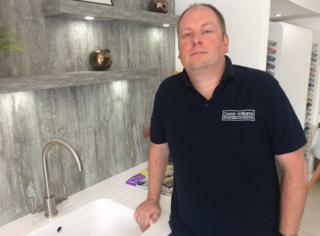 A kitchen showroom owner received an "absurd" But after checking his Leicestershire firm's water meter, the supplier insisted his still owes ?12,434, he said.Water Plus said it was trying to resolve the situation. Mr Williams, whose Coalville-based business faces disconnection and legal action, said water bills are usually about ?70 per quarter. "The amount of water we're talking about is something like one and a half Olympic-sized swimming pools. It's a huge amount of water," he said. "It's completely unfeasible that we could have used it. We run a small kitchen showroom with three employees here. We make a few cups of tea and use the toilet and that's it." Mr Williams received the original bill, which was for three months of water, on 25 July 2017.He spoke to Water Plus and they arranged for the meter to be changed, but then insisted there was nothing wrong with the original one. "I don't believe it is a leak; I don't know what it is," said Mr Williams. "Once the water meter was replaced the usage went back to normal so if we have had a leak it has miraculously repaired itself." Mr Williams applied to the Water Redress Scheme, which adjudicates on disputes, but Water Plus started their debt recovery process before the investigation had concluded. "The original bill was so ludicrous I assumed it would have been sorted out a long time ago," Mr Williams said. "I am now extremely concerned for possible ramifications on my company, and it is causing me a great deal of stress and anxiety." Water Plus said in a statement: "We apologise for the inconvenience this has caused Mr Williams. "This issue has been thoroughly investigated by us and the wholesaler, who carried out a water meter accuracy check which showed no fault. They also upgraded the water meter to ensure readings are accurate going forward. "Whilst the cause of the unusual consumption remains unclear, we are in direct contact with the customer to resolve this situation."